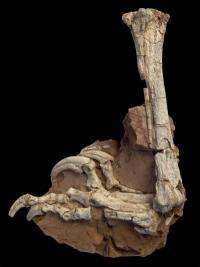 Paleontologists have discovered that a close relative of Velociraptor hunted the dwarfed inhabitants of Late Cretaceous Europe, an island landscape largely isolated from nearby continents. By describing a new double-clawed and highly-unusual relative of Velociraptor, paleontologists have answered a long-standing question: what did the Late Cretaceous predatory dinosaurs in Europe look like? Balaur bondoc, described this week in Proceedings of the National Academy of Sciences, is the first reasonably complete skeleton of a meat-eating dinosaur from the final 60 million years of the Age of Dinosaurs in Europe and provides insight into an ecosystem very different from that of today. Europe at the end of the Cretaceous was awash in higher seas and was an island archipelago dominated by animals smaller and more primitive than their relatives living on larger landmasses. "We've all been waiting for something like this, and the wait has yielded an interesting surprise," says Mark Norell, chair of the Division of Paleontology at the American Museum of Natural History and one of the authors of the research paper describing the fossil. "B. bondoc is heavy, with unexpectedly stocky limbs and fused bones. It shows just how unusual the fauna of the area was during the waning years of the dinosaur era." "Balaur might be one of the largest predators in this ecosystem because not even a big tooth has been found in Romania after over a hundred years of research," says co-author Zoltán Csiki of the University of Bucharest. "Fragmentary remains of Balaur were already known for more than 10 years, but the morphology is so weird we didn't have any idea where to fit them." Balaur bondoc, which means "stocky dragon," was unearthed in Romania by geologist and co-author Mátyás Vremir of the Transylvanian Museum Society. Higher sea levels at the end of the Cretaceous flooded much of present-day continental Europe, so Romania, which was an island, is now one of the best windows into Europe at the end of the Age of Dinosaurs. Other fossils discovered in these deposits include dwarf sauropods that were the size of cows and tiny duck-billed dinosaurs. These herbivorous dinosaurs had features not unexpected in island inhabitants: the so-called "island effect" postulates that island dwellers tend to be stranger and smaller than close relatives on continental land masses. Also, animals endemic to islands are often more primitive than their mainland relatives. 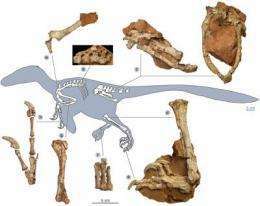 The new theropod fossil, the type specimen, is a partial skeleton that includes leg, hip, backbone, arms, hand, rib, and tail bones. But B. bondoc has 20 unique features when compared to its nearest relatives, including a re-evolved functional big toe with a large claw that can be hyperextended, presumably used to slash prey. Because there is also a large claw on the second toe, as is typical of the group of dinosaurs to which B. bondoc belongs, the new species has unusual double-clawed feet. Unique features are also found in other parts of the foot, leg, and pelvis. The feet and legs are short and stocky, with bones fused together, and the pelvis has enormous muscle attachment areas, indicating that this species was adapted for strength over speed. Finally, the hand is atrophied and some of the bones are fused, features that would have made grasping difficult. This, in combination with the leg and foot traits, indicates that the lower limbs rather than hands were used to grasp and disembowel prey. "Balaur is a new breed of predatory dinosaur, very different from anything we have ever known," says Stephen Brusatte, a graduate student at Columbia University who is affiliated with the Museum. "Its anatomy shows that it probably hunted in a different way than its less stocky relatives. Compared to Velociraptor, Balaur was probably more of a kickboxer than a sprinter, and it might have been able to take down larger animals than itself, as many carnivores do today." "Nevertheless, Balaur is the size of an oversized turkey and unlike what we know of the large predators from other parts of the world at the same time period, like Tyrannosaurus or Carnotaurus," says Csiki. "As European dinosaur faunas were known to be peculiar, we half-expected to find peculiar predators as well. But, as the first good record of these, Balaur surely exceeds our most daring expectations." But while B. bondoc has unique features expected from the "island effect," its relationship with other dromaeosaurs shows that there was some faunal exchange between the Romanian island that the mainland—at least among the carnivorous dinosaurs. "Because Balaur is related to dinosaurs like Velociraptor, it indicates that the European island archipelago had a faunal connection with other parts of Europe, Asia and North America where this group of dinosaurs has also been found in similarly aged rocks," says Norell. "It also shows how pervasive island effects can be in producing truly unusual animals." More information: The new fossil is described in the Proceedings of the National Academy of Sciences. The authors include Csiki, Vremir, Brusatte, and Norell. The research was funded in part by the American Museum of Natural History, the National Science Foundation, Columbia University Department of Earth and Environmental Sciences, the Romanian National University Research Council, Richard and Lynn Jaffe.